Before Google Instant launched today, I was a skeptic of the concept, as it was rumored. Search results that update as you're typing them? Thanks, but I'm not too lazy to hit "enter" at the end of a search. Google Instant is pitched as a way to shave seconds off search times, but where it actually seems most useful is for making slight modifications to search results. For example, if I want to read about Google's stance on evilness, the search term "Is Google evil" primarily brings up news and feature articles on the subject. Now I can tweak it and Tack on the word "doing." This surfaces Google's corporate philosophy page as the top result. Tweaks will come in handy for people who usually start their searches from dedicated browser search bars, instead of Google's home page. Another time-saving aspect of Google Instant comes when you're typing a word and the engine accurately predicts the rest, allowing you to stop typing before completing the thought. Google says this can save two to five seconds per search, but if you're a fast typist and smart searcher, it's probably less. Still, having your thoughts completed by a machine and the results automatically delivered is a wonderful feeling. Typing the phrase "Is Google" brings up, as the first result, an Atlantic article titled, "Is Google Making Us Stupid?" Now I'm tempted to read it, even though my original search had no intention of answering that question. These sorts of interruptions, however enlightening, are bound to come up during more pressing searches. 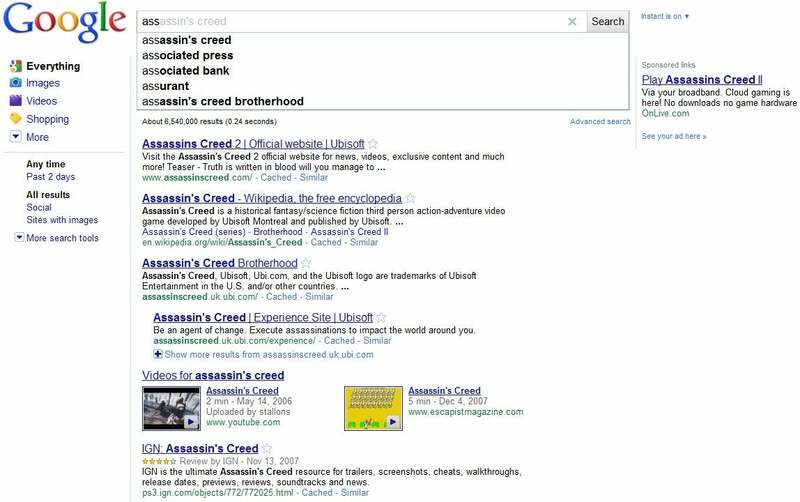 Adding a white space to the end of a search term can have a profound impact on the instant results. For example, a search for "tacos" brings up local business results and a map. 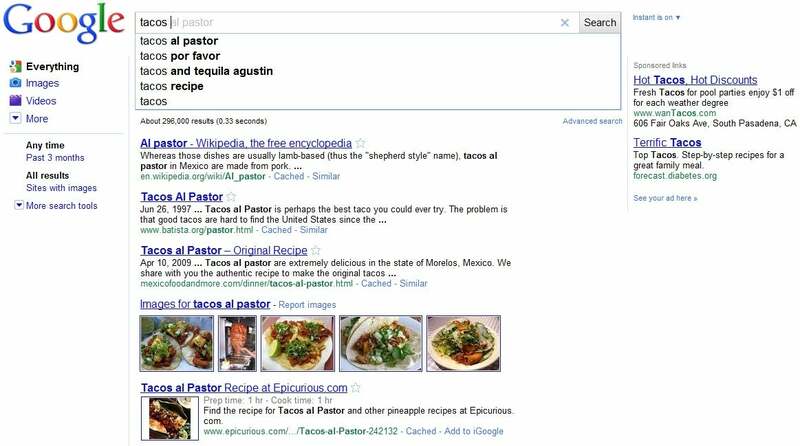 Tap the space bar, and suddenly Google Instant thinks you're looking for tacos al pastor, with no local results. This issue doesn't come up without Instant, because extra white spaces are removed. Even with Safesearch turned off, typing in explicit terms returned no results. I haven't tested this extensively, but all the usual curse words and reproductive organs are blacklisted from delivering instant results, showing nothing but a plain white screen when entered. Also, going "incognito" in Chrome turns off Google Instant (the service hasn't been switched on yet in my other browsers).